Jim Darlack also provided a canonical Gospels and Gospel of Thomas file included in this ZIP. If I may (and I will), allow me to make some suggestions for improving this feature in future versions of BibleWorks. It is not possible to print the texts in their synoptic layout. I realize this is a bit tricky to accomplish. With some multiple copying/pasting, one can use the texts in the Synoptic window and set up a table layout in MSWord. By way of comparison, Logos allows for exporting of their synopsis window to TXT [not helpful] or to HTML [which looks great]. One can also do a single copy/paste of the text into MSWord, and the text is presented properly in table layout. As far as I know, however, Logos does not have a multiple version [i.e., Greek and English] resource for the Gospels. 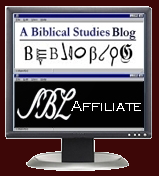 It must be possible to do, since Jeff Jackson did create a "Synopsis of OT Quotations in the NT" for Logos that allows for the display of Greek / Hebrew [and then hovering over the reference will give you the English as well]. UPDATE: John Fidel reminded me that the way to see both Greek and English parallels is to open two Parallel Passage windows and set each one to the desired language, and then resize them so that both are visible. Picky, picky... but the mouse scroll wheel does not work in the upper window. One hint on using the Synopsis Window: When you are working, for example, in one of the Gospels and you open the Synoptic Window, it will open at the text you were studying... unless the synoptic file you have open does not include it. (For example, you had an OT synoptic file open.) You then need to go File > Open > select a synoptic file. It will open at the first entry in that synoptic rather than at the text you were studying. Instead of trying to scroll through all the entries in the upper window, simply close the Synoptic Window and then reopen it, and it will then open at the desired point.